No individual or organization alone can solve a problem as complex and enduring as poverty. It takes an entire community to create lasting change. That’s why community events are essential to Solid Ground’s work – they bring program participants, partner organizations, community members and donors together so everyone can learn, build relationships, and work together toward solutions to poverty. A new partnership with Verizon is enabling Solid Ground to use event marketing to expand our network of anti-poverty activists. Through event sponsorship, Verizon helps us to expand, reach out, and engage more people who want to be involved in solutions to homelessness and poverty. Our community events build social capital to help alleviate the impacts of poverty and institutional racism. Thanks to Verizon for sponsoring multiple Solid Ground events in 2017/18! Too often, conversations about poverty go nowhere. You pass someone on the street and say, ‘Sorry, not today’ or ‘I don’t have any cash on me.’ You hear a colleague mention how horrible it is that in a city of billionaires, we have over 5,000 people living on the streets, and just as many in cars, shelters, or transitional housing. You learn how income inequality is rising in Seattle, how rents are skyrocketing. You feel that economic and racial segregation are built into the fabric of the city. We are constantly confronted with the stark injustices of our city. Yet the work cannot end with missed interactions or hopelessly recited statistics and failures. That’s why community events are central to our work. They are an opportunity to transform these stray, isolated thoughts into support, solutions and action. Our community events build social capital to help alleviate the impacts of poverty and institutional racism. 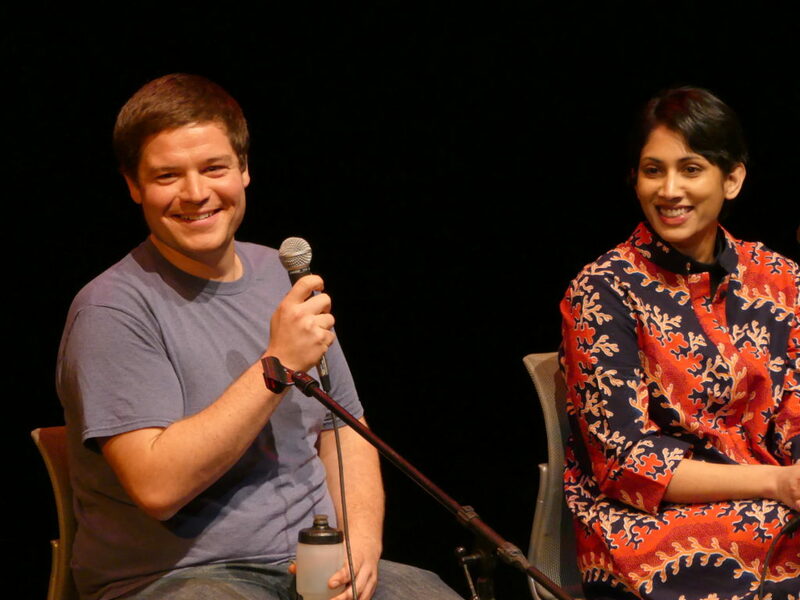 At the 2017 Food Justice Film Fest, Solid Ground Farm Coordinator Scott Behmer joined Veena Prasad of Project Feast and two other local experts on our Food Justice panel. 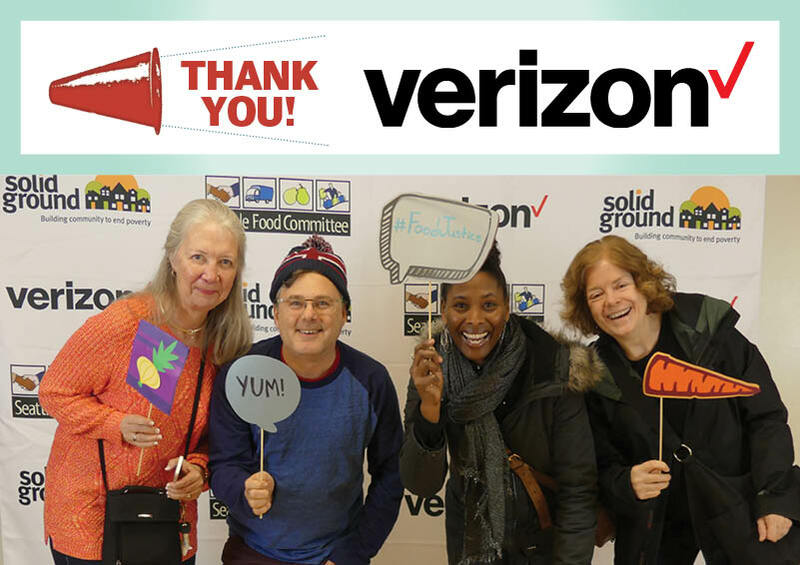 Our partnership with Verizon began in December 2017 with the Food Justice Film Fest, a screening of short films followed by lively conversation about sustainability and access in our local food system, held at the Langston Hughes Performing Arts Institute in Seattle’s Central District. With over 200 attendees, this event educated and connected collaborators to address the disparities in food access in our city and around the world. On March 28, Verizon will be Presenting Sponsor for Solid Ground’s 18th Annual Building Community Luncheon, featuring Ijeoma Oluo, a Seattle-based renowned writer on race, feminism and social justice. And in the evening following this year’s Luncheon, we’ll hold our first-ever After Party, a less-formal opportunity for people to support Solid Ground and participate in a more intimate conversation with Oluo. Want more Verizon-sponsored opportunities to gather with the Solid Ground community in 2018? Mark your calendars for our Food Truck Taste Off on June 27 and Farm to Table Dinner on September 15! Verizon is the Partner Spotlight in Solid Ground’s quarterly print newsletter. To sign up for email updates, the Groundviews Blog, or to receive the print newsletter by snail mail, visit our Get News & Updates page.